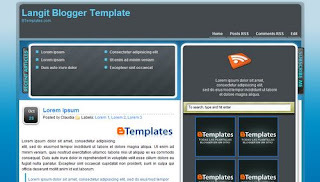 Hi friends, Langit is a wonderful blogger template and has many great features. However, this template lacked some features which I have added and tried my best to make this a complete template. Following are the new features added in this template. This template has a 2 column sidebar, but there isn't any option to add a widget which acts as a single column. Many templates have this feature, which enables the template to change from a 2 column to 3 column template and vice versa. I have added a single column just above the 2 columns which will allow you to put big adsense ads or any other big widget in the sidebar. Sometimes your blog post may be very big and they may stretch a great distance. If a reader wants to read the next post, he may have to scroll down for a long time which is frustrating. It is better if you add a Read More link for the post and make it short. It has been proven by many bloggers that adding Adsense in the posts helps in increasing the earnings. Hence I have added the option to add Adsense at the start and end of the posts. The ads will appear only if you visit the post page and not on the Home page. Seach <!-- Paste the Adsense Code here --> in the Edit HTML part of the Layout option and replace it with your Adsense code. Remember that there are two places where I have added the Adsense option. So you will find <!-- Paste the Adsense Code here --> at two places. Its upto you where you want to paste the Adsense code. Similarly replace YourFeedName with the one for your feed. That's it, just enjoy the new and modified template and don't forget to Subscribe to my feeds.